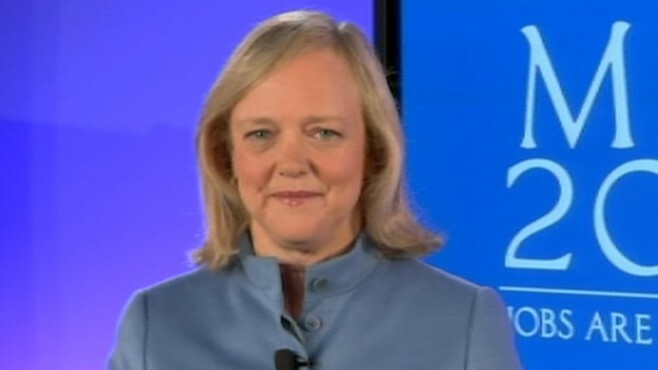 Remember Meg Whitman? She ran for governor of California, offering her eBay business acumen to turn around the disastrous slide that Arnold Schwarzenegger (R-Well, not really since he fucked it up) had presided over, and fell apart over a Gloria Allred represented illegal alien employment kerfuffle? Remember, when I mentioned her on this very blog a couple years ago? Still no? Then you better read up! Turns out that she was going to turn around HP because CEOs Republicans in the private sector know how things work, being that they have to show results or they're gone. Accountability being the theme. Usually after a hefty severance for your troubles, but still. So, how's HP doing? That once venerable leader of the technology industry just announced another set of layoffs. That makes the number to be laid off to around 50,000, an upward revision from an earlier estimate of 34,000. And what does the purported genius have to say? Yup. Stock price is around $32 a share. Good thing they hold private sector CEOs accountable, or someone would have to explain how laying off 16% of your workforce is creating jobs or making the company better, nearly 30 months after taking it over. What would the President of the USA do? Better yet, how would he be regarded if he were to run the country like Meg Whitman has been running HP?